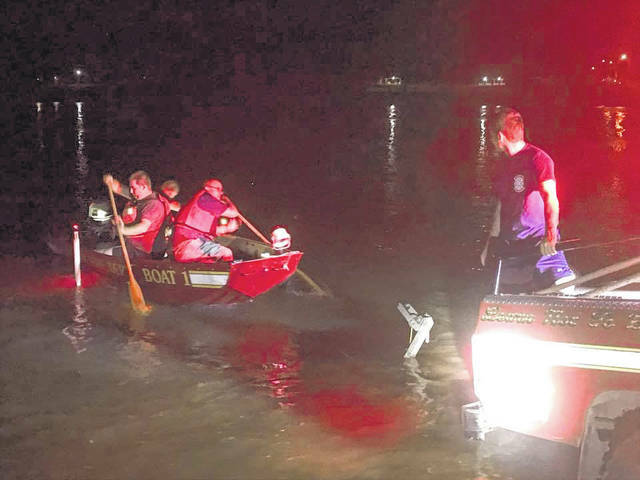 MASON — Four local volunteer fire departments spent part of the overnight hours searching the Ohio River after a report of a possible body floating in the Ohio River. Firefighters from the Mason Volunteer Fire Department were alerted around 9:45 p.m. on Wednesday night of a possible body in the river on the West Virginia side, in the area across from McDonald’s. Firefighters brought trucks and a boat to the area, requesting assistance from New Haven, Middleport and Pomeroy, according to a run report posted to the Mason Volunteer Fire Department Facebook page. With four boats and crews on land, firefighters searched the area from the Mason Park beyond West Columbia, searching the river, river banks, docks and campsites. Nothing was found in the area, with the boats returning to the boat ramp around midnight and operations called off. Also assisting on scene were the Mason Police Department, Mason County Sheriff’s Office and Mason County EMS.